A very remarkable brand of French style in a dormitory-style room is the relaxed composure of window treatment and its integration with the rest of the room. A rack in the master bedroom bowindow-a line of silk watercolor, with a small checkered border that matches the curtains hanging from the bed (bias-cut diamond shaped) – can share the shade of wallpaper and enhance the charm of the poster. The chairs are covered in a linen version of the same fabric as papered walls, thereby creating a quiet consistency in a room with a high degree of visual simulation. 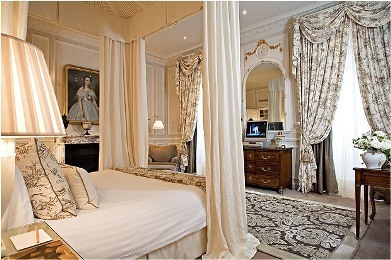 The informality of plaids bordering other fabrics, is faced with the drapery of the bed created for the master suite. The fabric Pastoral guest room is beautifully accented with delicate embellishment. In this room, a fine wallpaper room keeps the irresistible way. Red finds its way into the room and creates warmth, harmoniously unified fabrics with different patterns and scales-the Long contrasting plaid soft chair and wallpaper.